Following a 3-1 victory at the Grove this afternoon there was tremendous optimism amongst fans. True, we had beaten a team who had lost all but one of their last 14 away trips. But Burnley were no push over. They worked hard, but the truth was that Arsenal had ample opportunity to make the score line look more flattering than it does. Nicklas Bendtner was a man who was just having a bad day at the office. He spurned at least four chances in the second half that a more mature striker in good form would have put in the back of the net. But I'm going to be bold enough to predict he will step up next season and be in our top three goal scorers. The statistics say it all. Arsenal had 26 shots (three goals, six on target, ten off target and seven blocked) compared to Burnley's 9 (one goal, five on target and three off target). The day was made though for Theo Walcott. He seemed to be well shackled in the first half, having no shots on goal at all, despite being a menace with his pace and runs. But in the second half he came to life with five shots, scoring one goal. He showed the side of his game all gooners want to see. Darting, penetrating runs towards the heart of the opposition defence. From the right, he created numerous chances for Nicklas Bendtner. The Dane should really have had a hat-trick. Arsenal started the game brightly. The first 15-minutes saw us have most of the play. Rosicky had an effort that went wide, and then Burnley attacked and won a corner. From it Clarke Carlisle should have done better with his header and Almunia saved. Then Burnley came into the game more. 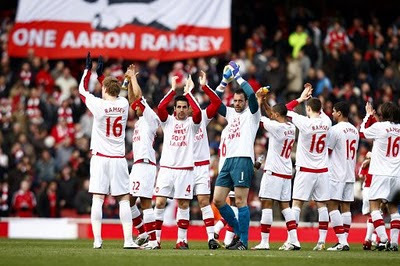 They had a number of shots on goal, none of which troubled Almunia. Arsenal's goal came after good work from Samir Nasri. The Frenchman is really finding the best form of his Arsenal career at the moment. With a wall of Burnley players in front of him, he chose to chip a pass into the box where Cesc Fabregas had made a darting run to the right hand side of goal. He placed his shot through the legs of Brian Jensen. One nil to the Arsenal. Diaby replaced Fabregas six minutes after his goal. Bendtner and Nasri had efforts neither of which went in. The second half started well and we had a chance inside the first minute. Bendtner yet again guilty of missing an opportunity you would have thought would have been easier to score. Burnley somehow managed to equalise. It wouldn't be Arsenal, unless we were trying to make things hard for ourselves. Eboue clears the ball from right back into central midfield. A Burnley player heads the ball back towards our goal and the bouncing ball isn't dealt with. I'm not sure who was suppose to be marking David Nugent, but he races through with both Silvestre and Vermaelen chasing him, but lofts the ball over Almunia into the goal. We then had to make one of our many chances count and it was the man making most of our goal opportunities turn to have a go at goal himself. Walcott came in from the right after a Bendtner pass and hit a left foot shot that went inside Jensen's far post. Arsene then made a couple of substitutions, Rosicky replaced by Arshavin and Eduardo on for Bendtner. This took the edge off our game for a while and we needed ten minutes of so to find our rhythm again. There was nervousness within the ranks, as a goal lead with our defensive form enough to give anyone the jitters. Plus we knew if we won by four clear goals, we'd go top of the league. Andrey Arshavin put those doubts to rest though with a goal, three minutes into injury time. His left foot shot going just inside the post to give us a 3-1 victory. We're now joint second on points in the table having played a game more than Chelsea. Manchester United going top with a 1-0 away victory against Wolves. The focus now switches to Tuesday and Porto at home. We have to hope that Cesc is going to be fit, but I would imagine he is a major doubt. And finally, a bit of gossip I heard from the training ground. Arsene Wenger was asked what he would have done if he had bumped into Ryan Shawcross while on England duty at London Colney. Wenger's response: Punch him. Apparently, Shawcross was told to keep well away from the Arsenal players during his time at Colney.